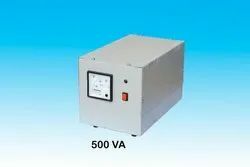 Manufacturer of a wide range of products which include 500 va constant voltage transformer, 2 kva constant voltage transformer, constant voltage transformer, 6 kva constant voltage transformer, 50 va cvt and 150 va cvt. Since our commencement, our firm is engaged to introduce a premium quality array of 500 VA Constant Voltage Transformer. 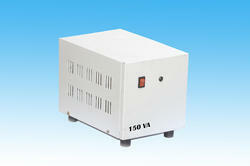 This transformer is made available for big industry and companies, which require online UPS transformer. The offered transformer is manufactured using OEM approved components and materials. Offered transformer is equipped with sensors and intelligent BIOS transformer that helps in providing online solutions that include shutdown, battery status, repair, and checking the integrity of the transformer. 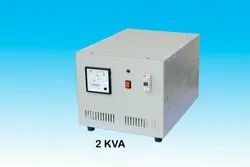 We are offering a powerful and highly reliable 2 KVA Constant Voltage Transformer. We can supply CVT as per customer requirement such as CVT with 24 V AC output, CVT with 110 V AC output. This well designed transformer is constructed using ultra modern technical specifications. In cases of overvoltage and over current distortion, this device holds the competent market position on parameters of performance and costing. • Efficiency: 90 % (Approx) under full load condition. • Waveform distortion: ±5% (Approx) under full load condition. 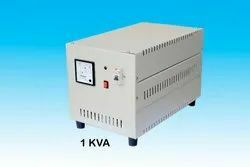 As an affluent name of this domain, we hold expertise in presenting high quality 1 KVA Constant Voltage Transformer. Provided transformer has input voltage of 1 KVA with a pure single phase wave. Such single phase transformer is made available in several configurations with diverse solutions. Once the production is over, our engineers opt for strict quality test to assure high performance of the transformer. This transformer delivers high accuracy in voltage supply. Clients can purchase the offered transformer from us at industry leading rates. 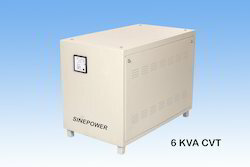 We are able to introduce an exclusive range of 6 KVA Constant Voltage Transformer. The offered transformer has fully digitalized control technique that helps I.T personals to detect and monitoring functionality. Also, the transformer is equipped with digital control static switch and zero changeover time. Further, the transformer system delivers full isolation between input and output phase. Use: Telecommunication, Color photography labs, Data Processing Equipment. 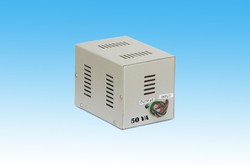 Looking for Constant Voltage Transformer ?